United Church of Christ Fort Lauderdale is a family church! We believe in family! We are a part of mainstream Christianity with 5,600 churches and 1.3 million members. We are part of a Mainstream Christian denomination of firsts. From the 1700s when the Congregationalists took a stand against slavery, to 1785 with the ordination of the first African-American Protestant pastor, to 1853 with the first woman ordained as a Christian pastor, to 1972 with the first LGBT pastor in a mainstream Christian denomination, to 2005’s celebration of marriage equality. United Church of Christ is a spiritual home where “All Are Welcome” and is known as a dwelling place where “God is Still Speaking.” Gracie Allen was a brilliant and perceptive woman. She left a message in her papers to be discovered by her husband after her death that has become the motto for the United Church of Christ: “Never put a period where God has placed a comma.” God is indeed still speaking! October, 14, 2018 United Church of Christ Fort Lauderdale will be celebrating 64 years of ministry. One of our outreach programs is called “Ruth’s Ministry” and has been feeding and clothing those in need for over 14 years. Every Thursday morning, the guests are invited to a church service which begins at 10:30am. Eighty to ninety guests gather with many of our 25 or more weekly volunteers for the optional church service held prior to the meal. Ruth’s Ministry provides over 8,000 meals a year, clothing for women and men, referrals to temporary housing, toiletries, and more and all served with compassion and love. UCC Fort Lauderdale believes in unity. 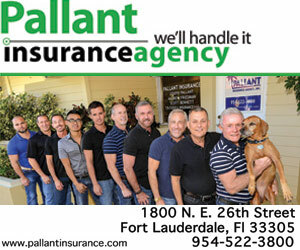 We work closely and partner with many community organizations such as Out of the Closet, Poverello, Smarty Pants’ annual Pet Project fundraiser, the KiKi Project and HIV Testing Center of The Pride Center, Gay Men’s Chorus of South Florida, World AIDS Museum and many others. We hold an annual Thanksgiving Interfaith Service, the Thursday prior to Thanksgiving with as many as 15 spiritual communities’ participation. The United Church of Christ denomination follows Jesus’ example of and passion for social justice. Our Children’s Justice areas include bullying, Economic Justice fighting hunger and poverty, Global Concerns regarding immigration, Human Sexuality including LGBT Rights, Racial Justice, Women’s Justice relating to Sexual Violence and Human Trafficking, and Health Justice in the areas of HIV/AIDS and Mental Illness. UCC Fort Lauderale’s worship style for our Sunday morning service is a blended style and very diverse. We are blessed by a spirit-filled music ministry consisting of a large spirit filled choir, and also liturgical dancers, dramatic presentations for the gospel readings, and music ranging from traditional hymns to spiritual secular arrangements. You are invited to come visit United Church of Christ Fort Lauderdale, where love and ministry happens. Our address is 2501 NE 30th Street, Fort Lauderdale, FL 33306, www.UCCFTL.org, or call 954.563.4271.